The production of bio-based polymers has become much more professional and differentiated in recent years. 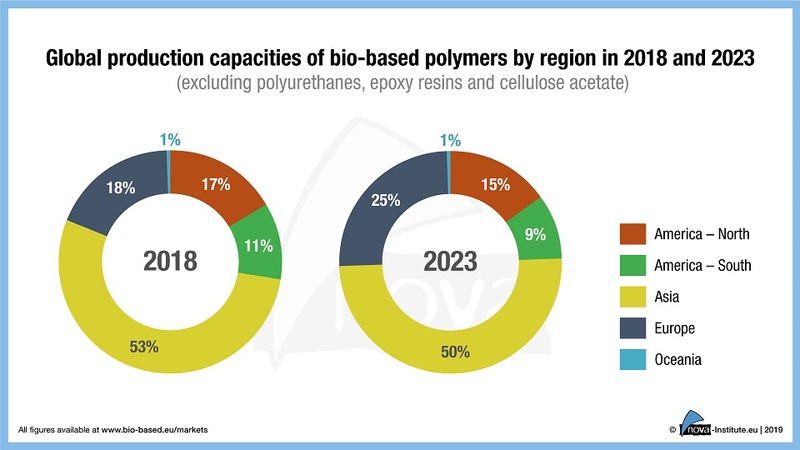 THE new market and trend report ‘Bio-based Building Blocks and Polymers – Global Capacities, Production and Trends 2018-2023’ from the German nova-Institute, shows capacities and production data for all bio-based polymers. In 2018 the total production volume reached 7.5 million tons – already 2% of the production volume of petrochemical polymers. The potential is much higher, but is currently hampered by low oil prices and a lack of political support. The production of bio-based polymers has become much more professional and differentiated in recent years. By now, there is a bio-based alternative for practically every application. 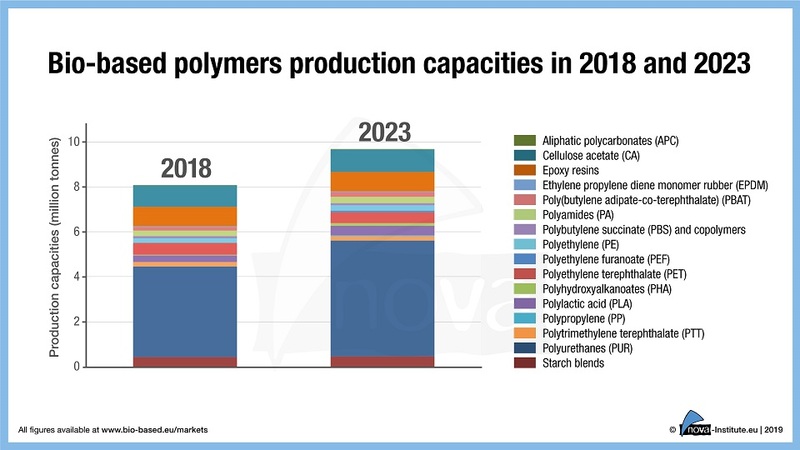 The capacities and production of bio-based polymers will continue to grow with an expected CAGR of about 4% until 2023, almost at about the same rate as petrochemical polymers and plastics Therefore, the market share of bio-based polymers in the total polymer and plastics market remains constant at around 2%. The increase in production capacity is mainly based on the expansion of the polylactic acid (PLA) production in Thailand and the polytrimethylene terephthalate(PTT) and starch blends production expansion in US. PLA and starch blends will continue to grow significantly until 2023. New capacities of bio-based polyamides, PE, PP and polybutylene adipate-co-terephthalate (PBAT) will also be added in Europe during this period. 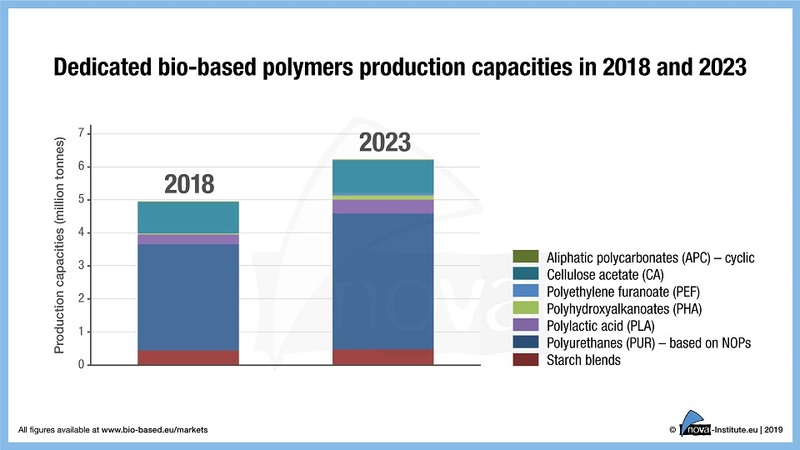 The great hopeful – polyethylene furanoate (PEF) – will presumably only be able to offer commercial capacities after 2023. Overall, the market environment remains challenging with low crude oil prices and little political support. So far, the two major advantages of bio-based polymers have not been politically rewarded. The first advantage is that bio-based polymers replace fossil carbon in the production process with renewable carbon from biomass. This is indispensable for a sustainable, climate-friendly plastics industry and is not yet politically rewarded. The second advantage is offered by about a quarter of bio-based polymer production: They are biodegradable (depending on the environment) and can therefore be a solution for plastics waste. Only a few countries such as Italy, France and, in future, probably Spain ,will politically support this additional disposal path. The most important market drivers in 2018 were brands that wanted to offer their customers environmentally-friendly solutions and critical consumers looking for alternatives to petrochemicals. If bio-based polymers were to be accepted as a solution and promoted in a similar way as biofuels, annual growth rates of 10 to 20% could be expected. The same applies as soon as the price of oil rises significantly. 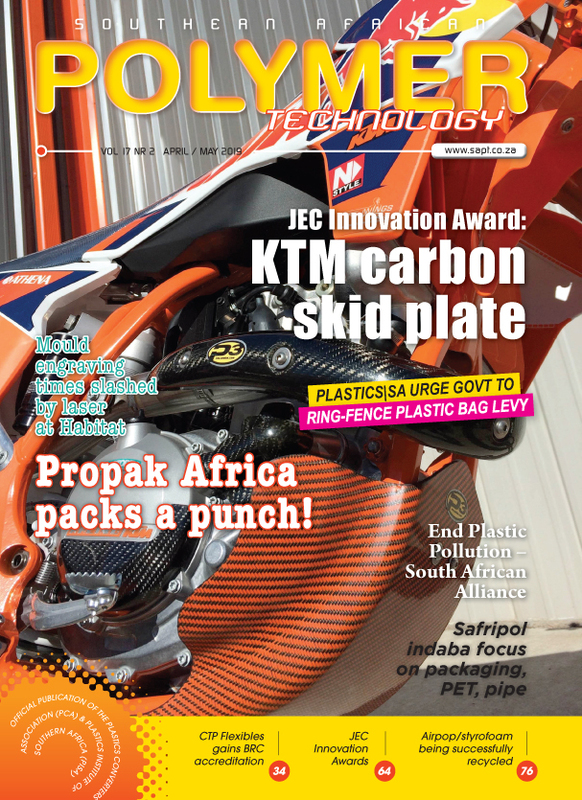 Based on the already existing technical maturity of bio-based polymers, considerable market shares can then be gained. The market and trend report is written by the international biopolymer expert group headed by the nova Institute. The authors come from Asia, North America and Europe.